Standing on a terraced hillside behind the new Inn at Moonlight Beach, a master gardener picks carrots from the thriving, biodynamic garden he’s created for the inn. Juaquin Lawrence Herschman hands me a carrot and explains the significance of observing the rhythms of the natural world for preparing the soil, sowing seeds, cultivating the plants, and harvesting their bounty. For Juaquin, a man who exudes tranquility and joy, biodynamic gardening is a way of connecting the soil with the human soul; of nature becoming conscious of itself. Juaquin has been a devoted practitioner of biodynamic organic gardening since the 1970s, when he began his studies with pioneers in the field: Peter and Charlotte Dukich and Alan Chadwick. 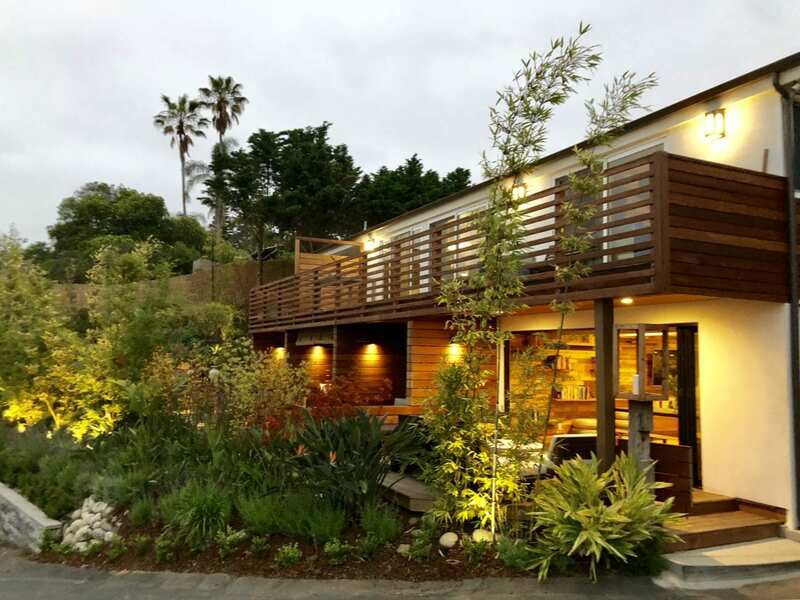 His work has taken him all over the U.S., Central America, and Europe, but his most recent project has been close to home: the creation of the gardens surrounding the Inn at Moonlight Beach in Encinitas, California. When Shangwen and Mike Kennedy purchased the Inn at Moonlight Beach in 2017, the aging property and its grounds were in poor condition. 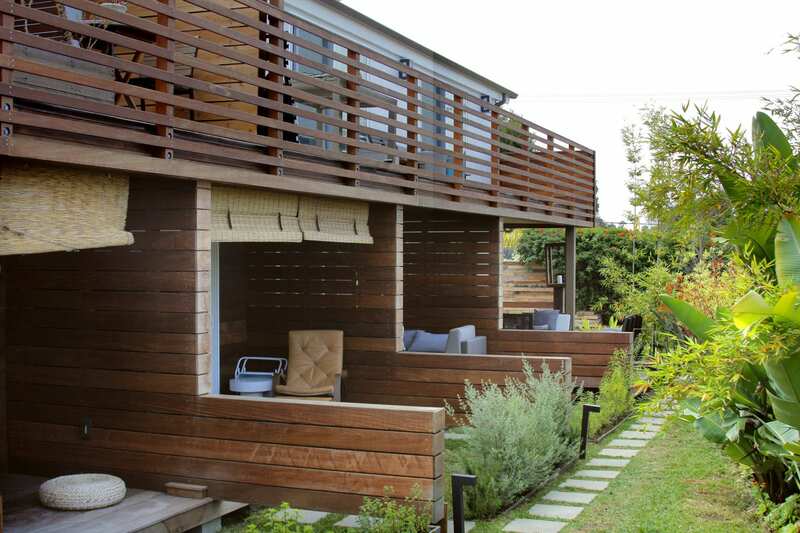 As a Harvard-trained architect and landscape architect, Shangwen was keen to introduce biodynamic gardening as a vital component in transforming the property into a modern retreat designed to nourish life. 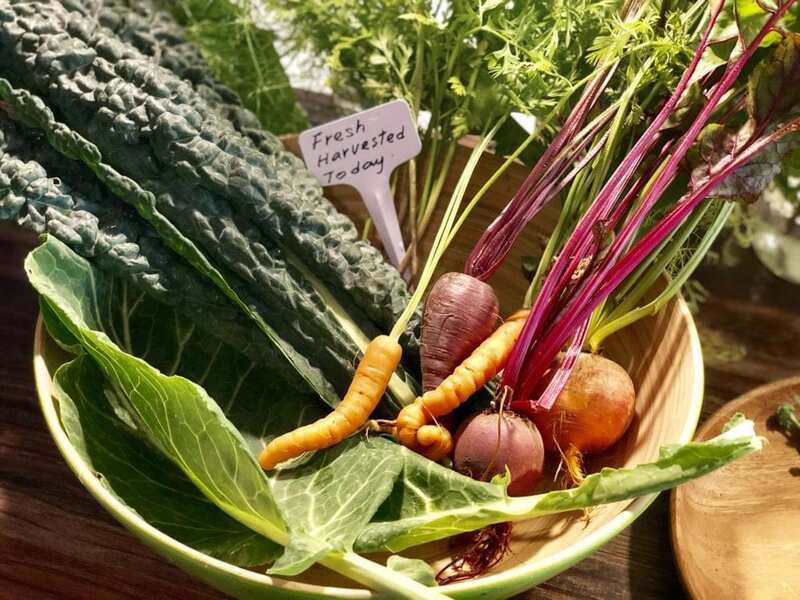 Under Juaquin’s guidance, the inn grows its own organic fruits, herbs, and vegetables for its guests. 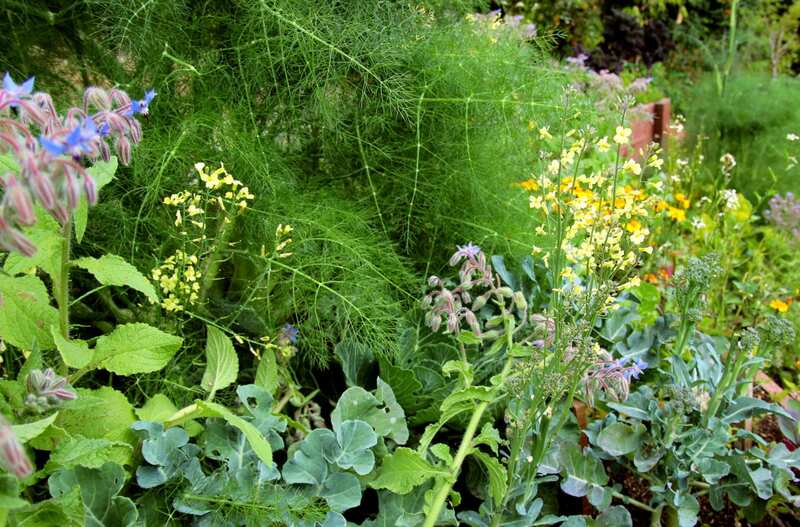 The innkeepers encourage guests to harvest items directly from its gardens. In addition, the gardens produce flowers for the guest rooms and the tea leaves and herbs that are dried, blended, and brewed to welcome guests upon arrival. In addition to the transforming the grounds surrounding the inn, Shangwen and Mike also embarked on an extensive renovation to modernize the building, incorporate elements of Feng Shui, and adhere to WELL Building Standards. Going beyond LEED certification, WELL Building Standards seek to enhance human health and well-being through design and operational features of the built environment. WELL Building Standards are grounded in medical research that explores the connection between buildings and the health and wellness of their occupants. Every detail about the inn–from the biodynamic gardens, to the air- and water-filtration systems, to the lighting–has been carefully considered with the guests’ wellness in mind. The new, thoughtfully redesigned Inn at Moonlight Beach just re-opened last summer and is set to become the first hospitality building in the world to earn the WELL Building Standard certification. From the moment you enter the property, the inn’s design initiates its calming influence. Japanese boxwood, lavender, rosemary, and bamboo greet guests from the formal entry garden. A meditation garden featuring succulents and a trickling fountain stands in the far northwest corner. In the ceremonial hallway, flickering lanterns cast a soft glow on the white stucco and vertical wood-slat walls. 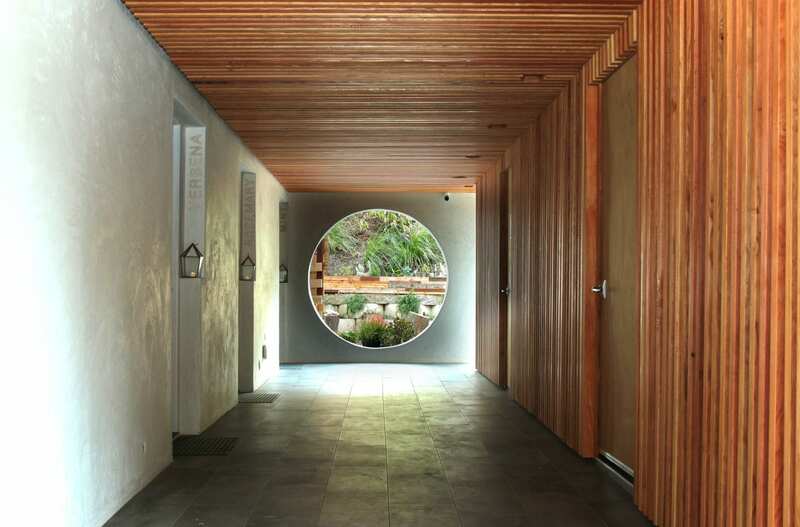 At the far end of the hallway, a large circular opening representing the moon overlooks a private garden. On the opposite end stands an altar to Lakshmi, the Hindu goddess of abundance. Each suite is minimalist in its design with a soothing neutral color palette offset by fresh-cut flowers from the gardens. Upon arrival, guests are greeted with a freshly-brewed cup of tea and fresh fruit, as well as the soothing scents and sounds from the in-room aromatherapy diffuser and sound therapy machine. Most of the inn’s five suites offer full or partial ocean views with private decks designed for yoga, meditation, and relaxation. 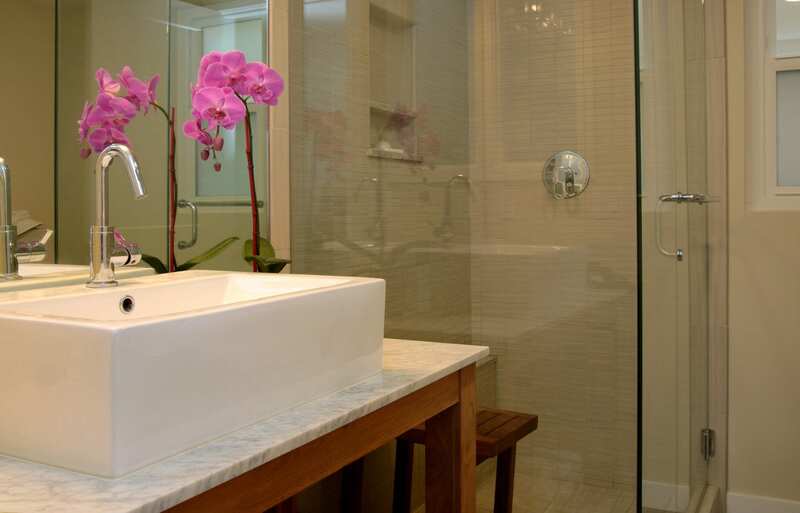 The spa-like baths feature deep soaking tubs with complimentary bath salts and candles, glass-enclosed tiled showers, vessel sinks, and premium bath amenities. The cloud-like eco memory foam mattresses are wrapped in luxurious 5,000-thread-count linens and topped with down-alternative comforters and pillows. Accent walls in each of the rooms are made from the inn’s reclaimed wood siding and recycled construction materials. The suites also feature fully-equipped kitchenettes, large flat-screen TVs with DirecTV, complimentary WiFi, and individually controlled heating and air conditioning systems. Each morning, the innkeepers deliver a healthy start breakfast to the room in a picnic basket for enjoying in the room, on the deck, in the gardens, or at the beach. Complimentary organic tea, coffee, fresh fruit, and healthy snacks are available for guests 24 hours a day in the common area, which as doubles as a space for wellness classes. Sunlight pours through the common area’s accordion glass doors that open to an outdoor seating area overlooking the ocean. 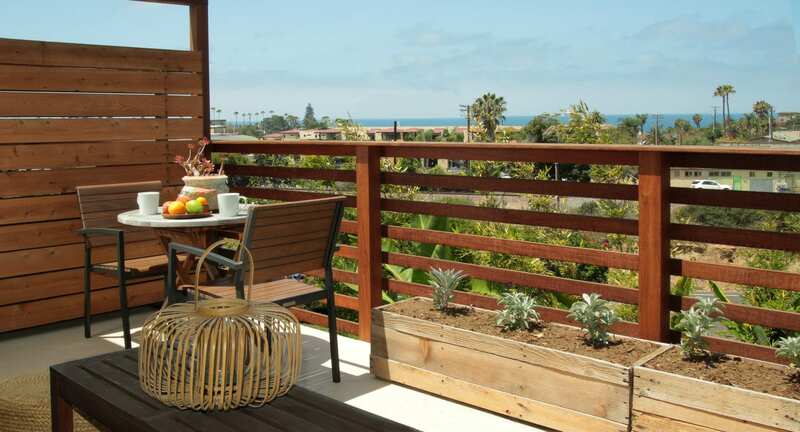 The Inn at Moonlight Beach is located just a short walk from Moonlight State Beach as well as the shops, cafes, and yoga studios in downtown Encinitas. North of San Diego, this historic beach town is considered the birthplace of yoga in the West and is known as one of the world’s top surfing destinations. 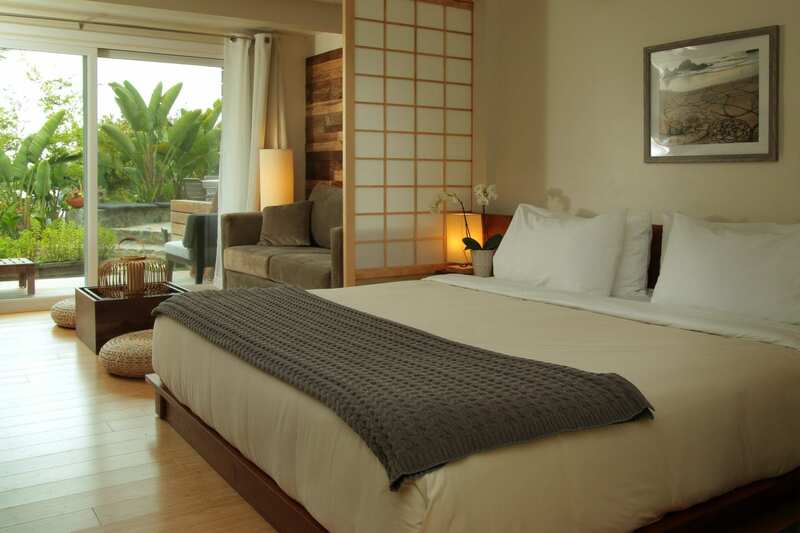 The new Inn at Moonlight Beach offers a distinctive lodging choice that harmoniously blends elegant luxury with well-being and reflects the spiritual and authentic natural beauty of Encinitas.